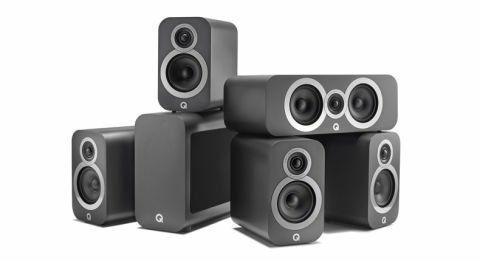 Q Acoustics 3010i 5.1 Cinema Pack review | What Hi-Fi? If a 5.1 home cinema package comprises four five-star speakers, then it would appear to be well over halfway to five-star fame itself. The majority of the Q Acoustics 3010i 5.1 Cinema Pack is made up of two pairs of the company’s 3010i standmounts, to which we gave five stars earlier this year. And they aren’t let down by the accompanying 3090i centre speaker and 3060S subwoofer. The 3010i 5.1 Cinema Pack offers a like-for-like replacement for the Q3000 5.1 Cinema Pack speaker package, also a five-star hit back in 2015. It is a tad pricier than its predecessor, which entered the market at £700. However, Q Acoustics justifies that price hike with a smattering of new improvements, from honed aesthetics to new drivers and improved cabinet structure. The centre speaker features the same 10cm mid/bass driver as the 3010i, while the unit in the 150W active subwoofer – the slimmest sub the company has made – is, unsurprisingly, larger at 20cm. The centre and 3010is both feature a 20mm soft dome tweeter, and benefit from the same P2P (point-to-point) cabinet bracing and thickened baffle in the drive for structural rigidity. Though you can sit the 3010is and the footless center speaker on a sturdy flat surface, we’d recommend saving some of your budget for stands. Q Acoustics may point you to its 3000FSi speaker stands (£149 per pair) or 3000WB wall bracket (£20 each). The subwoofer can be tucked away on the floor, ideally close to the front speakers for optimum integration. If you can extend your budget, you might consider swapping the front 3010i pair for two 3050is floorstanders - this would bring greater scale, greater presence and greater expense - the package cost would rise to £1345. For those wanting Dolby Atmos and DTS:X set-ups, Q Acoustics offers matching installation speakers (£159 each, plus installation costs) – though this option isn’t reviewed here. With five speakers and the sub wired and ready to go, the package provides a convincing surround sound presentation that, like its predecessor, is bags of fun to listen to. That’s not surprising, considering the front and rear channels are made up of speakers we called “rhythmically entertaining” as a stereo pair. You get a strong sense of their hi-fi roots, their effortless musicality breezing through the enjoyably eclectic soundtrack of Edgar Wright’s Baby Driver. Whether it’s the rhythmic drum beats in Kashmere Stage Band’s Kashmere, the jazzy piano in Carla Thomas’ B-A-B-Y or the bouncy basslines that drive Baby’s recorded remixes, the Q Acoustics ensure they’re lively and dynamic. In the opening scene, Baby’s finger taps, the windscreen wipers sweeps and the gentle revving car come through with clarity, and the 3010is keep one hand on guitar rhythms in The Jon Spencer Blues Explosion’s Bellbottoms underneath the cacophony of the car chase. It’s all backed up by decent scale and spaciousness – winning traits for home cinema set-ups, of course – as well as tight integration between the speakers. Placed around our AV testing room, they manage to deliver a gapless, busy-yet-coherent soundfield. As the smallest standmount in the 3000i range, the 3010is can only bring so much bass in terms of quantity and depth, though – so that is where the subwoofer comes in. We play Alien: Covenant and the sub brings definite low-end presence to the otherwise bass-limited presentation, seamlessly taking over from the 3010is. It provides atmospheric rumble when the Covenant hovers on-screen, and more devastating bass during thunder and explosions – even if it’s not the most hard-hitting during impact notes. Underneath the subwoofer’s rear magnetic door are not only connections but also controls for setting level, crossover and switching phase - so we’d check those before calibrating the package with your AV receiver. During the opening dialogue between Guy Pearce and Michael Fassbender, the centre speaker takes the opportunity to reveal its facility for detail and tonal synchronicity with the 3010is. Pearce’s voice is clearly projected, with a richness that gets under his commandments while also laying bare the curiosity in them. The alarm triggered onboard reiterates the package’s enveloping presentation, with a depth to the sound of fire extinguishers, closing doors and panicked footsteps. Again, the 3010i’s dynamics can ominously build strings in the score, and cause sudden thuds to jump out. As well as the speakers picking up details such as computer sounds, dripping water and rustling leaves, they communicate them with subtlety too. With the speakers’ new silver rings building on what was already a neat and stylish package, it’s hard to find fault with the Q Acoustics 3010i 5.1 Cinema Pack in either aesthetic or sonic terms. Whether as a stereo pair (3010i or 3020i standmounters or 3050i floorstanders) or as a full surround sound package like this one (for anyone after an affordable and entertaining home cinema speaker set-up), we can highly recommend the 3000i series.